A few years ago, a new kind of workout started cropping up in gyms, Pilates studios, and on the Instagram feeds of Hollywood actresses and Victoria Secret models alike. Barre-fit sells itself as a synthesis of Pilates, isometric strength training, and ballet, for the purpose of sculpting the lean, toned, bodies so envied of ballerinas. But where did this explosive fitness trend come from, and why bother adding a new class to your exercise regime? Barre has its origins in 1950s London, the brainchild of German-born former dancer Lotte Berk. Lotte, a contemporary ballet dancer who had trained under legends like Mary Wigman and Marie Rambert, developed the method after injuring her back. With the assistance of an osteopath, Lotte began incorporating dance conditioning, yoga, and barre work into her rehabilitative therapy. The synthesis of these disciplines helped her regain her strength and flexibility, and eventually was codified into a discipline she called the Lotte Berk Method. With exercise names like “Naughty Bottoms” or “Peeing Dog”, the method delivered long, lean bodies and drew a celebrity following from the likes of Yasmin le Bon, Joan Collins, and Barbra Streisand. One of Berk’s students, Lydia Bach, brought the Lotte Berk Method to America, where it evolved into modern barre-fit as we know it today. How does it work? Rather than using large compound movements like squats or leg presses, barre classes focus on isometric strength training that targets specific sets of muscles. By using high repetitions of small, slow, and controlled movements, participants break through the larger muscle groups that tend to take over and target accessory muscles, making them more elastic. When combined with cardio, dance, and aerobic movement, these isometric exercises produce the lean, toned bodies that are the trademark of dancers everywhere, while burning some serious calories – a typical one hour class can burn anywhere from 300 – 400 calories. So what are the benefits of barre-fit classes? Well perhaps first and foremost is that barre-fit is a relatively low-impact form of exercise. Despite its evolution over the years, barre-fit in many ways remains true to its roots as a form of rehabilitative exercise. It is less stressful on joints than jogging or cross fit, and its concentration on alignment, posture, and small repetitive movements provide a low risk avenue for conditioning and strengthening without injury. Secondly, the small isometric movements emphasized in barre classes target many of the underused “support and steady” muscle groups that we neglect in traditional exercise classes. These micro movements sculpt muscles quickly, strengthening and toning these muscles and improving balance, flexibility, and overall stability. But perhaps the best benefit of barre classes? It’s fun! Barre fuses the best of yoga, Pilates, and ballet in a approachable and fun group atmosphere. Incorporating the latest hits with engaging choreography in a supportive environment, barre-fit is suited to people of all ages and abilities who are looking to enjoy themselves while improving their overall fitness. Curious and want to give barre class a try? 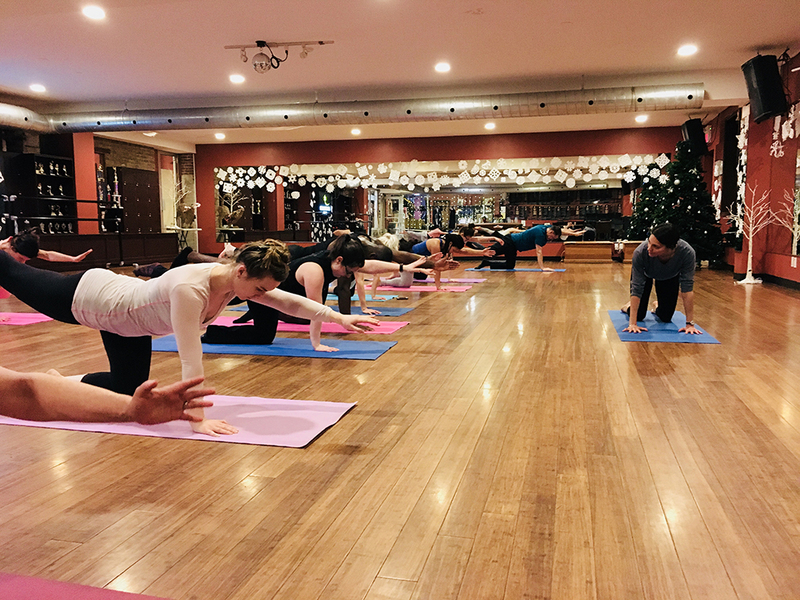 Join us for our barre-fit classes with Irene Yacoub every Wednesday at 7:00 p.m.
Alex has returned to dance as an adult after a ten year hiatus, and has dabbed in a variety of dance styles including jazz, acro and ballet. She is currently enrolled in the Royal Academy of Dance Exam Program at Joy of Dance.